HIP HOOP JUNKIES - A Toronto Raptors/NBA/Canada Basketball Blog: Canadian Watch at the Tournament - Let the March Madness Begin! Canadian Watch at the Tournament - Let the March Madness Begin! Who's in your final four? Well, it's March and it's time to fill out your bracket for your NCAA tournament office pool. 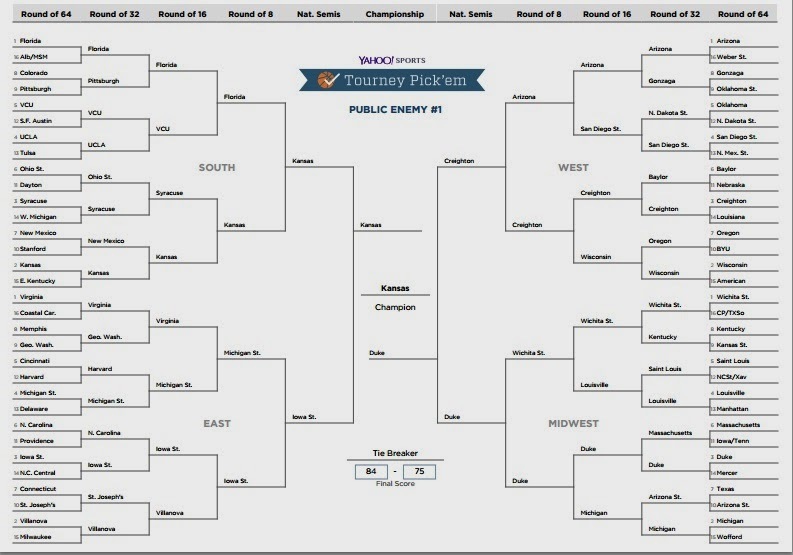 I'm an NBA guy and in no means an NCAA tournament expert by any stretch of the imagination. But, I do fill out a bracket every year at the office and my strategy has always been the following: 1) find four expert brackets online, 2) chose a quadrant from each expert bracket, 3) pick Kansas to win and BAM, my bracket for the office pool is set. Check out my full bracket here. I normally pick Kansas to win it all each year, but with Canadian homie Andrew Wiggins on the Jayhawks pushing to be that number one draft pick in next season's NBA draft, I see him finishing off his 'one-and-done' season on a strong note, bringing Kansas to the championship. He started off slow in this first season with Kansas but he's been steadily on the rise in the past month. I also have the Iowa State Cyclones in the Final Four, with another Canadian shoutout to Toronto native, Melvin Ejim, this season's Big 12 Player of the Year. Other Canadians to watch out for are Tyler Ennis out of Syracuse (I have them losing at the Round of 16 to Kansas), Kevin Pangos at Gonzaga (I have Gonzaga moving to the round of 32, but then losing to Arizona) and Nik Stauskas at Michigan (I have Michigan at the Round of 16 losing to Jabari Parker and the Duke Blue Devils). My Cinderella Pick: Harvard - Academic rankings have to account for something, right?? My bracket has them upsetting fifth ranked Cincinatti in the first round. Plus, they have three Canadians on their roster: Agunwa Okolie, Patrick Steeves and Laurent Rivard. It should be a crazy tournament for Canadians with 25+ Canadian players in the tournament! Who's on your bracket? Let us know who's in your final four in the comments, tweet @HipHoopJunkies with the hashtag #MarchMadnessVIP or better yet, join our HHJ Final Fo' Pick'em and post your brackets! Information about PrimeSport: The only official source for Official NCAA Tournament tickets- PrimeSport is the Official Ticket and Hospitality Provider of the NCAA® and a fans one stop shop for game tickets, private suites, pregame hospitality, and travel to every round of the NCAA Men’s Basketball Championship and Men’s Final Four®. Fans can follow their team from the very first tip-off, all the way to the Final Four at AT&T Stadium. The VIP Experience at the NCAA® Final Four® – PrimeSport is the Official Ticket & Hospitality Provider of the NCAA® and offers fans an opportunity to be a VIP at the Final Four with premium game tickets, private suites, and access the official VIP in-stadium hospitality party hosted by Bill Walton and John Salley. VIP in-stadium hospitality includes upscale food presentations, open premium bar, live entertainment and much more.